I had never read a Red Sonja story before now, partially due to my lesser interest in swords and sorcery tales but to a greater extent because of the exploitative bent to the main character's chain mail bikini (why I avoided books like Witchblade and Fathom, too). Red Sonja Vol. 1: The Queen of Plagues, therefore, stood out to me as a curious oddity: still the buxom barbarian in chain mail on the cover, but written by Gail Simone, known for portraying strong and realistic female characters. How would these two seeming opposites reconcile? Simone's Red Sonja will ultimately feel and sound very familiar to fans of her work -- especially to fans of Simone's Birds of Prey and Wonder Woman -- which went a long way for me in bridging the gap of unfamiliarity I had with the character. Simone makes an effort, I think, to acknowledge and honor Sonja's chain mail origins (drawn attractively but without gratuitousness by Walter Geovanni), but then also to move Sonja beyond these origins as the story progresses to become something greater than she might have originally seemed. Simone's Queen of Plagues is an origin story of sorts -- it is not Red Sonja's origin per se (which I appreciated, because I'm a little bored of origins), but the story involves and eventually details some of how Sonja became "Red Sonja." In rebooting Red Sonja's origins, Simone removes some of the more disconcerting elements of the original (no mention of Sonja being unable to have a relationship with a man unless he beats her in a fight, for instance) and leaves something very straightforward -- her family is killed, Sonja is conscripted to a gladiator arena, she's rescued by a kindly king, and now that king needs Sonja's help against a marauding army. As the first issues of a new series, Red Sonja ought be very accessible, and it is -- no prior knowledge of Sonja, Conan, or the world in which they operate is necessary to understand this book. Despite Sonja's initial pin-up-esque appearance, Simone turns the book on strong themes of women's relationships -- Sonja's damaged friendship with her now-enemy Dark Annisia, for one, and her mentorship of mostly the women of the kingdom and two young women in particular. Though Sonja is scantily clad, Geovanni's paneling is never focused on Sonja's anatomy, nor does Simone make it a story element (compare, for instance, with Judd Winick and Guillem March's Catwoman, where the aims are just the opposite). Sonja is treated as a warlord and general, a legend in her own time, and while her gender is acknowledged, it is nicely tertiary to the story and the job that Sonja is asked to do. While Queen of Plagues is a self-contained six-chapter story, arguably it's also a collection of three related two-part stories. It's notable that after the second issue, in which again the audience has seen Sonja as general and warlord, Simone takes Sonja out of the chain mail bikini (and never puts her back in it again); the second two issues are more spiritual, of sorts (aside from the occasional beheading) as a plague-ridden Sonja stumbles through exile and then returns to the kingdom. Surely Simone's placing of Sonja in sackcloth here is more than a sartorial statement; rather, new readers meet a Sonja more philosophical than we might have expected, feeling guilty over having outlived her family, speaking with the ghost of her father, and finally digging her own grave according to the customs of her people, in expectation of her own death. These issues end with swordplay, but they demonstrate that Red Sonja is more than that. The final two issues see Sonja trade costumes again, this time for a full suit of armor. Simone saves the book's twists and turns for last, and so while well constructed, they come at a dizzying pace; the book's villain has seemingly been Annisia, but this changes not once but twice in the span of a couple of issues. I appreciated that Simone's Red Sonja story is more than just a good guy versus a bad guy, and I'll know now to expect that in future issues. I also liked that while the "sword and sorcery" vibe is strong in this book, the resolution turned out to be "swords and science" instead; it seemed a nice touch to me that there isn't any magic per se so far in this story, but rather Simone sets the story in a semi-realistic world just on the border between clinging to mythology and embracing modernity. On the other hand, though Simone's resolution via Sonja for the kingdom's leadership vacuum works for the story (as Sonja finally persuades the two sisters to be leaders rather than warriors), I also though it somewhat implausible -- two kids are going to lead a kingdom? I hope Simone might revisit this later, examining what unintended consequences there might be to Sonja's decision. Simone's voice comes through very distinctly in Red Sonja; this is not a bad thing, but rather helped me as a new reader feel more comfortable with Red Sonja and in her world. Toward the end of the fourth issue, as an exhausted Sonja fights one of her former captors, Simone has two narration boxes, "Perhaps ..." and "Perhaps I can take this last one with me as I go." Though this one-two construction is not unique to Simone, I'd argue it's all over her recent Batgirl material, and the line put me in such a mind of Black Canary that I'd bet I'd find something similar in Birds of Prey if I looked hard enough. Fans of Simone's other work who might not necessarily venture out to Red Sonja, like me, should. Again, the general flavor of Birds of Prey is strong here -- free associating, I'm reminded for instance of Huntress's face off against Lady Shiva in Birds of Prey: Endrun. Simone's Red Sonja, too, feels akin to Simone's Wonder Woman, and surely there are parallels to be drawn between Diana's battle with Genocide in Wonder Woman: Rise of the Olympian and Red Sonja's conflict with Annisia here. I did find it curious that, again, in a book that largely turns on the relationships between women, Red Sonja's father gets most of the credit for making her who she is, while her mother never wholly appears on the page. It hardly seems right that in a story with as strong a female protagonist as Red Sonja, her mother gets none of the credit; my hope is that this, too, is an intentional oversight on Simone's part, fodder for a story yet to come. 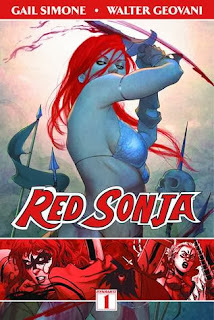 I have no idea how exploitative, or not, the various Red Sonja series have been over the years, but this was clearly a title I would have felt some hesitation picking up. With Gail Simone at the helm, that concern abates, and what Simone and Walter Geovanni accomplish here is to take what could clearly be a comic book stereotype and instead build an exciting, bloody, character-driven story out of it. Red Sonja Vol. 1: Queen of Plagues is worth your time; I never thought I'd be saying this, but I'll be keeping an eye out for Red Sonja Vol. 2. We'll start next week off with a little L'il Gotham. See you then! I did not read Fathom, but Witchblade is great... yes, there are runs where the Witchblade undresses the main chars covering only the strategic spots, but later in the game she gets more covered up, and at the same time elevating the story! I would recommend the first Ron Marz trade as jumping on point! Anyway, I wanted to tell you that I've been reading your blog for a while and I loved your post about the Legion. I would love it if you could visit my blog, I've been writing about the heroes of the 31st century lately.